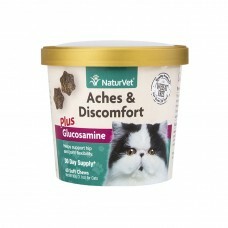 NaturVet Aches & Discomfort PLUS Glucosamine helps to support minor aches and discomfort caused by everyday activity. This unique combination of ingredients is Veterinarian formulated to provide natural support in managing a pet’s discomfort. The added benefit of Glucosamine provides extra joint support important in maintaining healthy hip and joint function. For use in cats over the age of 12 weeks. 1-2 soft chews up to two times per day. Brewer’s Yeast, Cod Liver Oil, Flaxseed Meal, Glycerin, Lecithin, Natural Flavoring, Oat Groats, Rice Flour, Sorbic Acid, Vegetable Oil, and Wheat Germ.